I've been meaning to follow up on a previous post that looked at the Walgreens development, and how it affected the property tax revenue from the parcels it will occupy. As I studied it (with my untrained eye) it seemed that the property tax revenue that would be generated from the development would fall short of of the $53,000 that was generated with the old property. I alluded to this post several times afterward, lamenting this finding, as well as the plain fact it was never considered. Based on preliminary information from Hennepin County, estimated tax revenues for the Walgreens development is in the $100K - $105K range which will be an increase over previous uses on the site. Of this amount, the City of Mound receives a share of this total. It is important to note that the City of Mound does not control the assessed values and final tax numbers for the Walgreens development would be determined as part of the County’s annual tax assessment process. I asked the city why would Walgreens pay over two times the property taxes Mound True Value currently pays, and they couldn't answer that question. 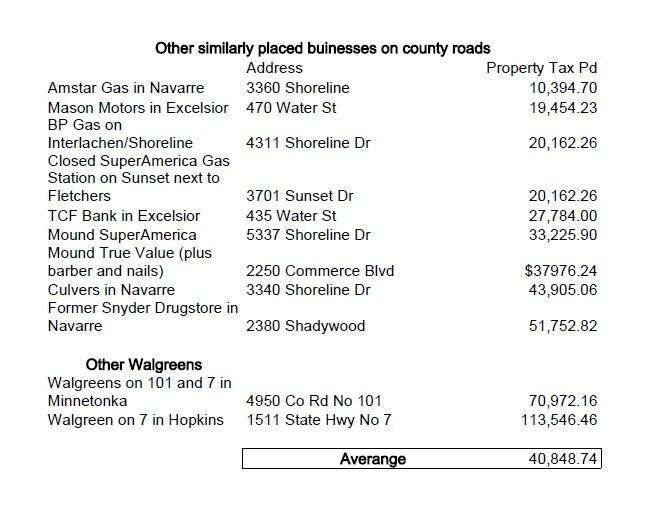 Here's the list of properties again that I looked at, and none of them are close to what Walgreens will pay. So I apologize for sharing my poor analysis of the situation. I am still learning. I still think it's important for cities to consider the question of property tax generation in developments. It is important that the city be able to pay for the services it provides, and all sources of revenue need to be examined more closely. In my opinion it is ethically wrong for a city to look at tax generation when considering development. Whether the property is zoned commercial or residential, any city that denies a development because it doesn't generate enough taxes is falling down a slippery slope and straight to court. If a commercial property owner wants to build a modest cafe on a lot that they own -- legally the city cannot and should not deny this if it meets all the zoning criteria. A city can not say, "I am sorry, a bigger better restaurant could be built here instead and would generate more property tax revenue for the city, so we are going to deny your application." Same goes for residential property. If a property owner wants to build a small house on a big lot, the law says that is o.k. No city has the right to say, "I am sorry you can't build this house because it is not valued high enough." Any city official or politician who denies a development application based on amount of tax generated should be run out of town. Sarah, the question isn't whether or not someone's right to build what they want where they want should be protected. The question is if cities should spend or incur long-term liabilities for infrastructure which will never pay for itself due to the land uses it serves. Most cities stick themselves with an overbuilt infrastructure and then the tab eventually comes due, and this is why many American cities are broke. Municipalities should instead be wise in their spending, making sure the built environment sustains itself before agreeing to any sort of infrastructure upgrades or tax incentives or zoning variance approvals. Eventually places will start to have inherent value that can be captured not only through a very small property tax by the city and county, but more importantly by land owners who are able to thrive because of their proximity to other place-friendly land uses. Then people will likely choose to use their land in a way that is the highest and best use according to the marketplace, although of course they retain the freedom to under-utilize it if they so desire. This is really about creating a system with less regulation and more free market outcomes. Unfortunately this system of post-WWII development we see in America has been culturally explained as a result of the free market, but it has been heavily subsidized by a half century of federal and local debt. Psst! Hey Mound... want some candy? !